Welcome to Cedar Creek Crossing, a gorgeous cabin located atop an isolated mountain range offering views you have only dreamed of. This three-story cabin offers breathtaking visuals in all directions and comfortably sleeps up to fourteen people. This isolated area is perfect for groups that want to experience nature together without being bothered by anyone else. The cabin has all you need to have a wonderful vacation. From the game room with a billiards table, to the large outdoor grill, and hot tub your group will be fully entertained while relaxing and taking in the serenity of nature. When you’re ready to venture out of the cabin Pigeon Forge and its many attractions are only minutes away. Consider stopping by Apple Barn Winery located just minutes from Pigeon Forge. 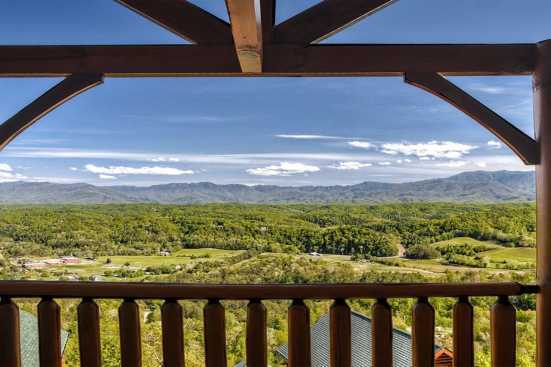 After sampling some of the famous wine and southern food at the Winery you will be primed and ready to hit the trail at Smoky Mountains National Park. When arriving at the park consider stopping by Cades Cove. Cades Cove is known as a world-renowned nature preserve, where you will experience a variety and closeness to wildlife most people can only dream of. SmokyMountainsByOwners.com is your one stop shop for all your Eastern Tennessee vacation needs. Bring your friends and family out for an amazing private mountain top vacation rental experience.